Hadleigh Heritage talk by Gordon Sinclair 23rd March 2019 in St James The Less. 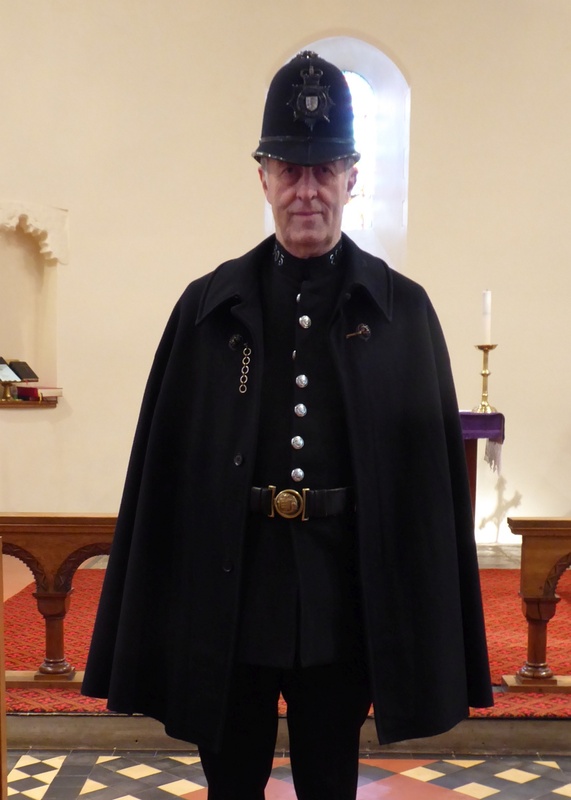 Including the famous 19th century cloak; our famous speaker was arrayed in his 1880 model uniform specially made for Gordon as Constable 805 by Hobsons of Kenneth Road. Gordon laid out the history of policing in Essex in general, and this area in particular, starting February 1840 with the first Chief Constable; Captain MacHardy. The uniform needed no pockets up to 1914 because the role of the copper on the beat was to take miscreants to court promptly and for justice to be dispensed immediately. From 1914, policemen had to write down the details, and so needed a pocket book and pockets! An early policeman in Thundersley was PC Ponder, whose his pocket book is rich in the names of families, many of whose descendants were dealt with by Gordon many years later. The Southend police force was independent from 1914 to 1969, and better resourced than the Essex units, so that cooperation and support for the Thundersley and Hadleigh police was often forthcoming from Southend. Gordon gave the detailed strength of the various police units in Castle Point when he started as a policeman. There were many more officers than at present. Hadleigh had a police station, there were police houses in Hart Road and near the Weir- – regrettably all gone. The audience was amazed that an officer patrolling at night at one end of Hadleigh could hear a break-in at the other end of Hadleigh. We were disappointed to hear that our anecdotal views on 999 calls were confirmed, not many now get a timely response; clearly the reduction in the number of police officers and the growth of the population has meant that different crimes not only attract different priorities but mean that there is also reduced support for officers. The original concepts of community policing resourced to enable preventative work through e.g. visiting schools; and officers on the beat to create a strong, positive relationship between society and its police service have been much weakened, particularly over the last 20 years or so. The age-old adage of “a stitch in time saves nine,” is never truer than having problems nipped in the bud before they move from antisocial behaviour to criminality. The audience was very appreciative of the detailed facts Gordon wove into his talk and his patient explanations in the Q & A session at the end. Can anyone remember who was based in the Police station in Hadleigh in 1944? Was having a discussion with my elderly Mum and she was trying to remember names etc….